Notice: This is the OLD tachometer design which is present for reference only. 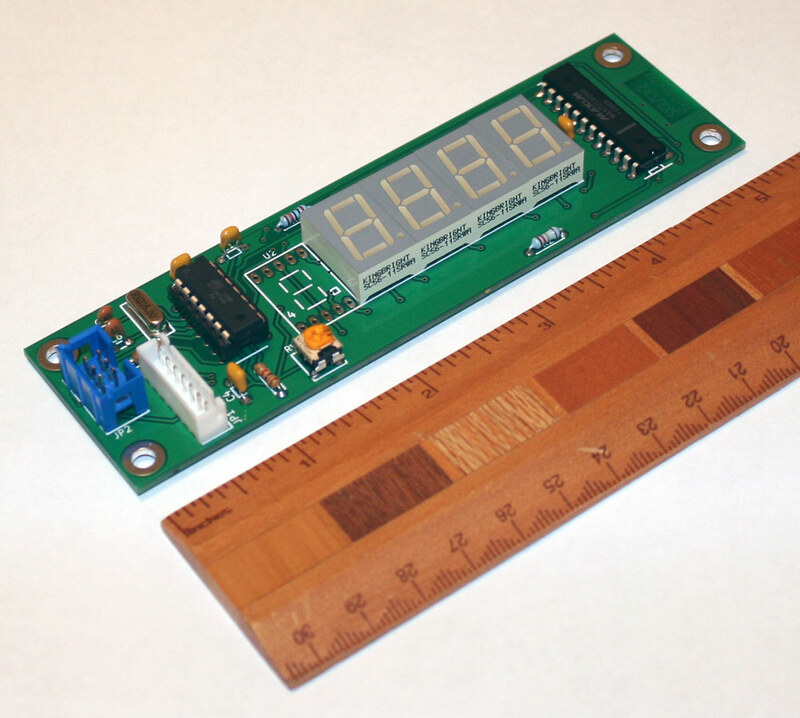 Please consider purchasing a v2 tachometer kit! They are smaller, less expensive, and offer more features! Simply click the "Buy a V2 Kit" tab above this text. Thank you! Note the red/blue 7-Segments look a bit different in person (they are easier to read). I think they are camera shy. Kits and assembled units are avaliable now. They include everything you need except an enclosure for the tachometer. 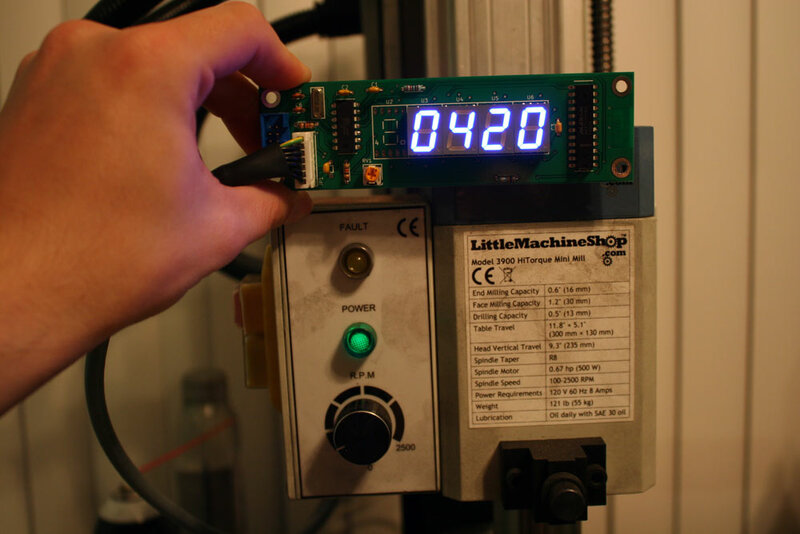 That includes the pcb+all components, a pre-programmed microcontroller to work with sx2 mills and cn2 lathes, your choice of red/green/blue 7-Segments, a pre-built tachometer cable and strain relief. 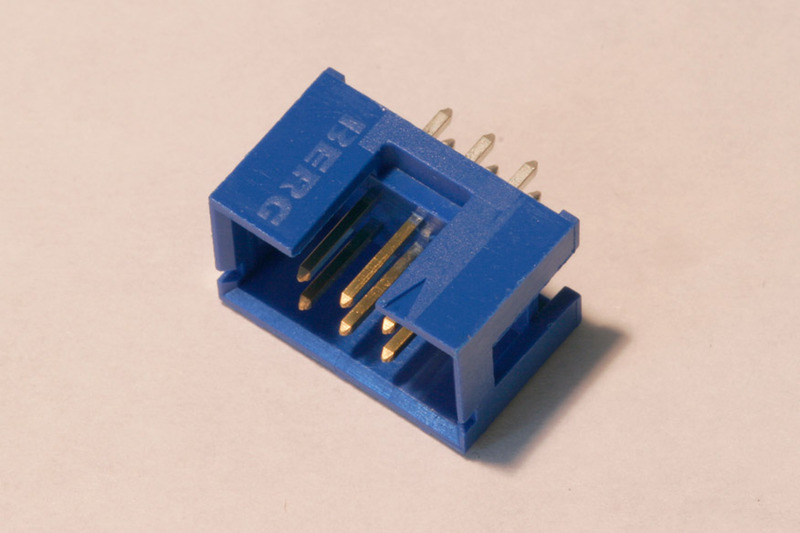 The kit also comes with a 3-pin XH JST connector+ wire which can be used to add a forwards/reverse switch to the SX2 Mini mill. You can purchase one via the "Buy Now" paypal button below or email me via the contact page if you have questions. You can calculate shipping for both U.S. and international orders based on the current cost of a Small USPS Priority Flat Fate Box on the USPS website. What models is this compatible with? 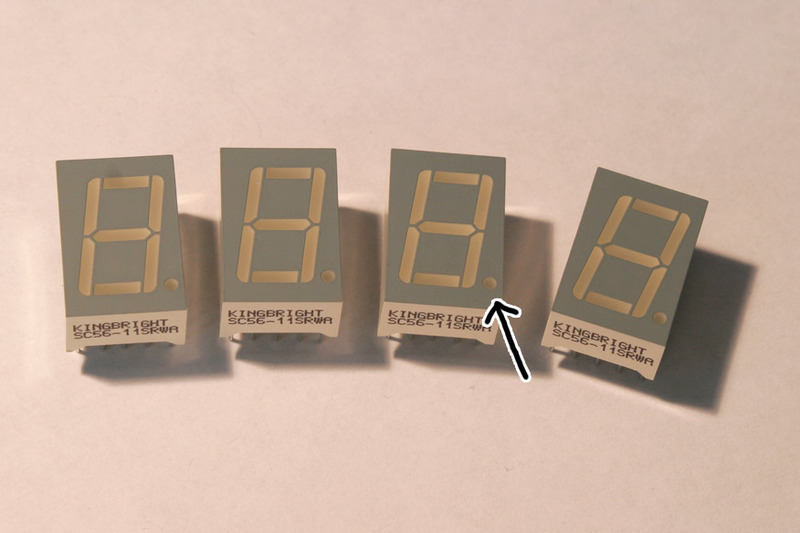 Install the 7-segment displays in the areas marked U3, U4, U5, and U6. DO NOT POPULATE U2. 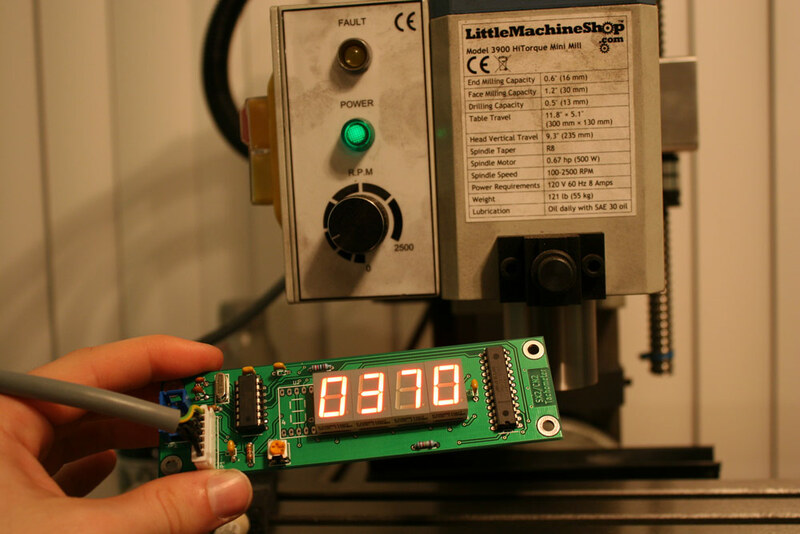 Before soldering, verify the decimal spot on the 7-segment matches up with the decimal point on the PCB board. Scotch tape is useful to align the elements while soldering. 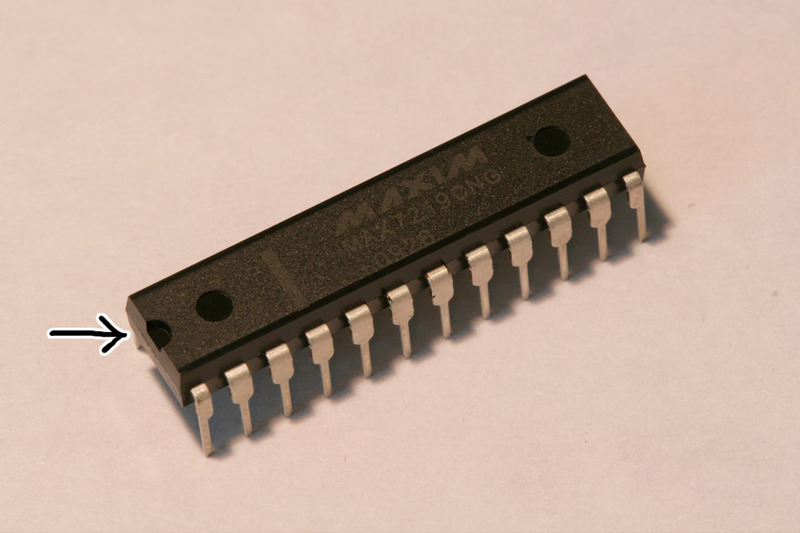 Install the MAX7219 IC in the area marked U1. Before soldering, verify the side of the IC with a notch on it is on the same side as the rectangular orientation marker on the U1 silkscreen. 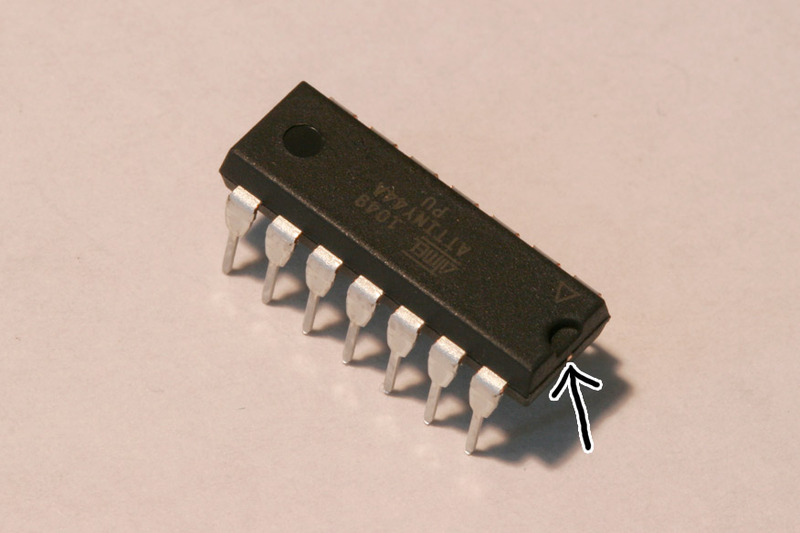 Install the ATtiny IC in the area marked U7. Before soldering, verify the side of the IC with a notch on it is on the same side as the rectangular orientation marker on the U7 silkscreen. Install the 16Mhz crystal in the area marked Y1. The orientation of this part does not matter. Optionally, install the 2x3 avr mini-isp programming header on your board. When installing, verify the notch on the header aligns with the silkscreen orientation marker. 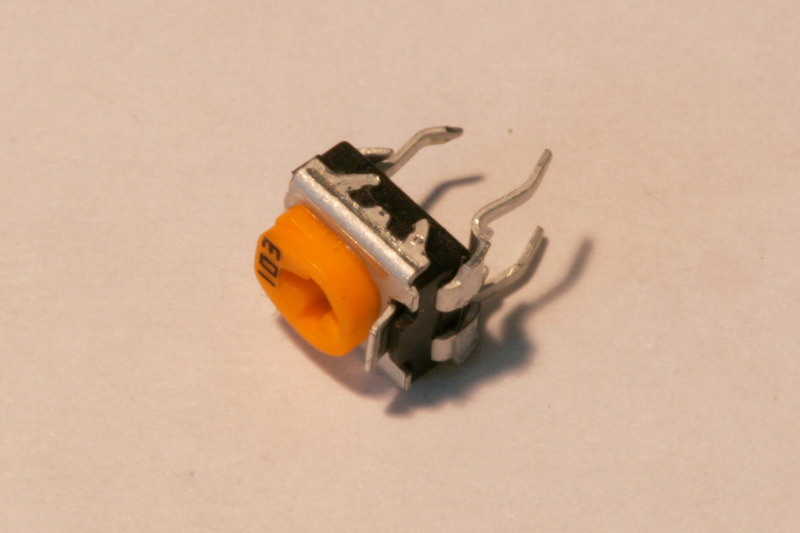 Install the 27pF capacitors in the areas marked C5 and C6. The orientation of these components does not matter. 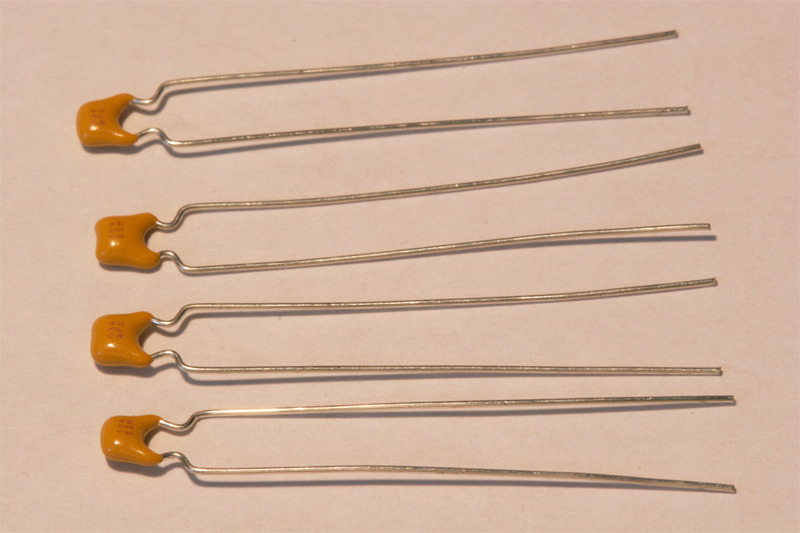 Install the 0.1uF capacitors in the areas marked C1, C2, C3, and C4. The orientation of these components does not matter. 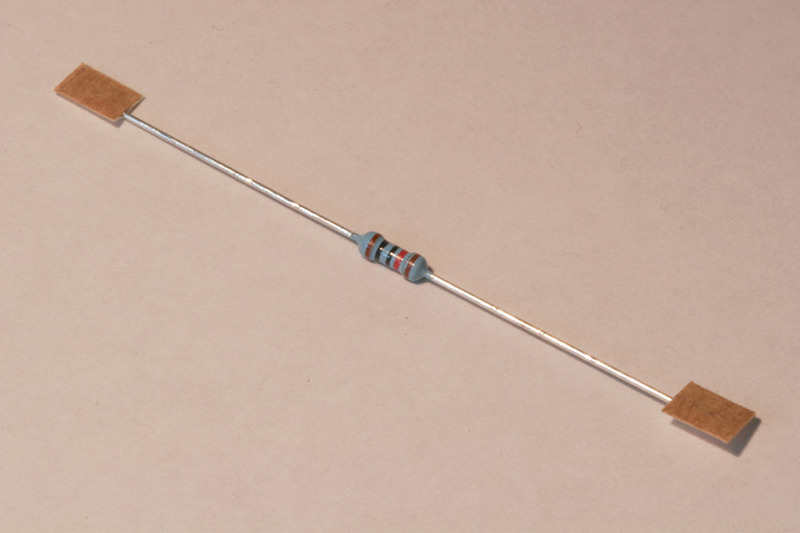 Install the 1K resistors in the areas marked R3 and R4. 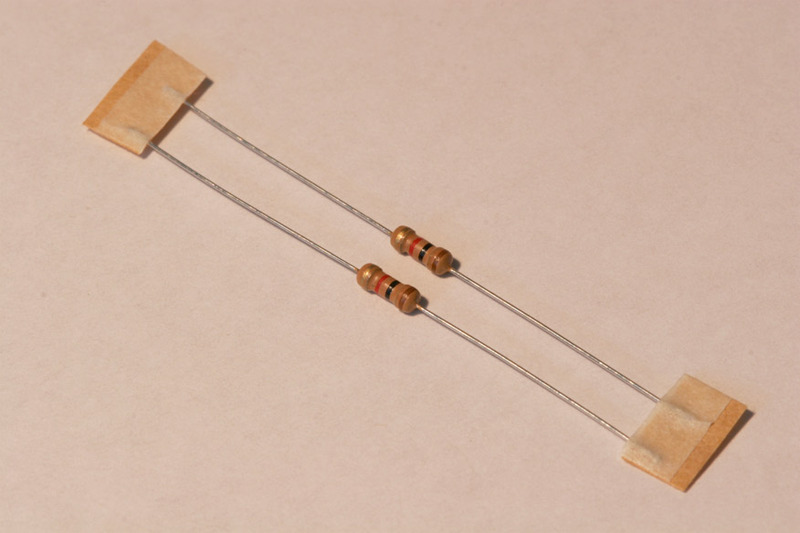 These resistors can be identified by their 4 color bands (Brown, Black, Red, Gold). The orientation of these components does not matter. 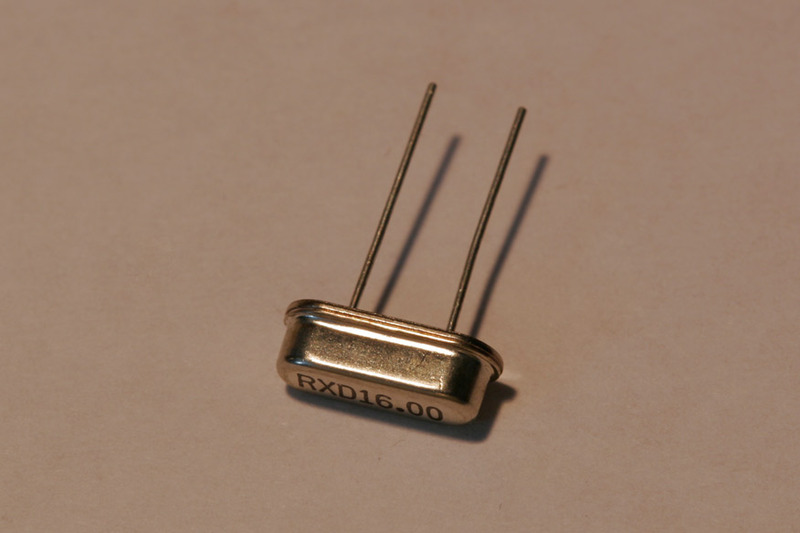 Install the 10K resistor in the area marked R1. 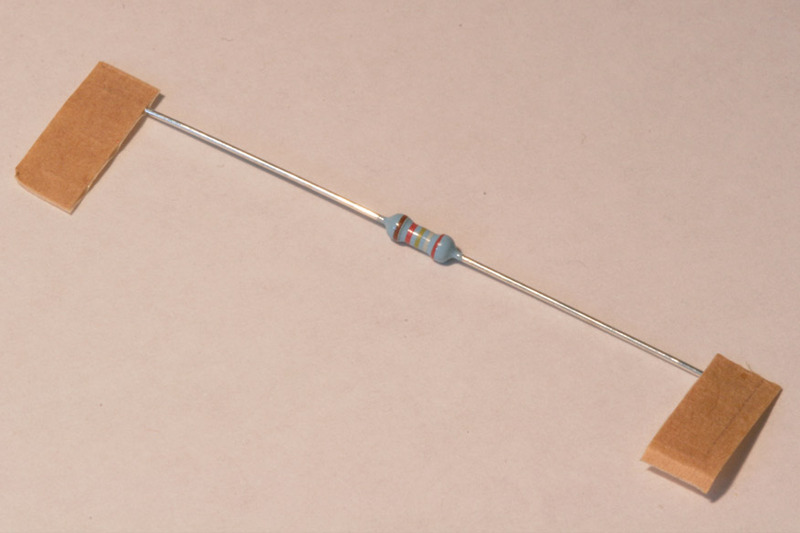 This resistor can be identified by it's 5 color bands (Brown, Black, Black, Red, Brown) The orientation of this component does not matter. Install the 29.4K resistor (for red 7-segments), 27K (for green 7-segments), or 20K (for blue 7-segments) in the area marked R2. 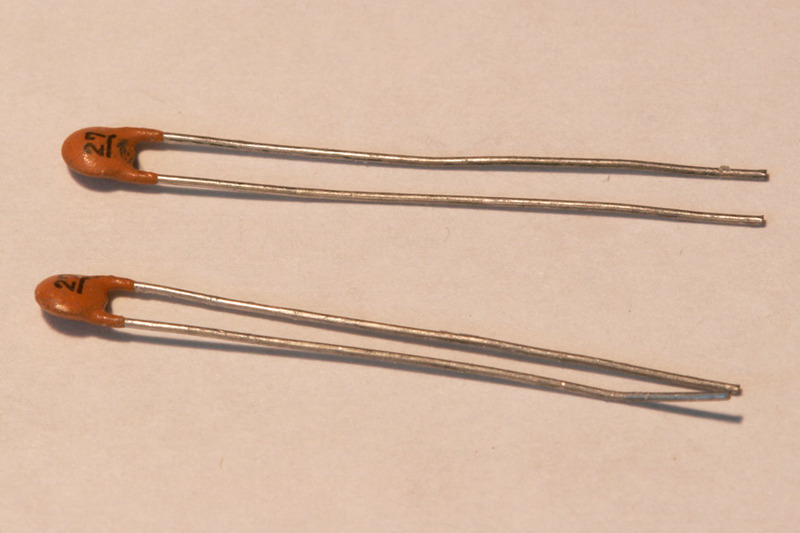 This resistor can be identified by it's 5 color bands (29.4K = Red, White, Yellow, Red, Brown) (27K = Red, Grey, Black, Red, Brown) The orientation of this component does not matter. Install the potentiometer in the area marked RV1. 1. Power off the mill or lathe after stopping the spindle from rotating. 2. Verify soldering and orientation of components. 3. 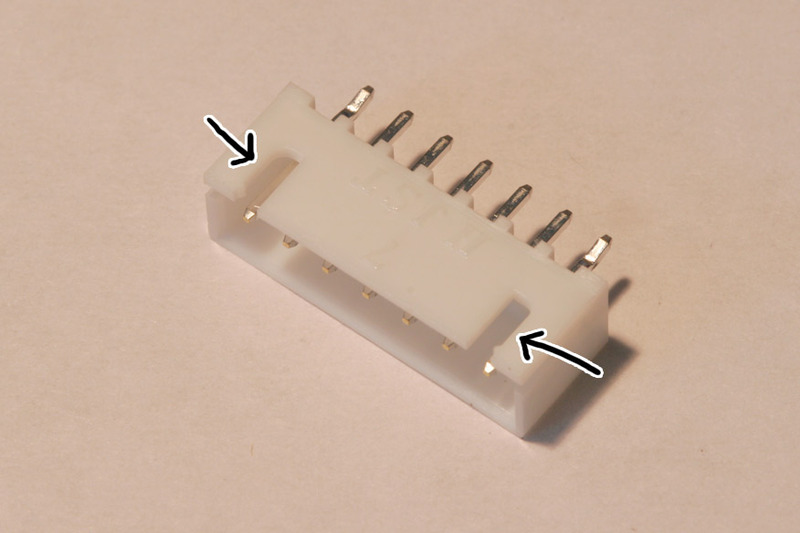 Plug the provided 7-pin connector into the sx2/cn2 tachometer board header. 4. Connect the 7-pin DIN connector to the mill/lathe. 5. Power on the mill. 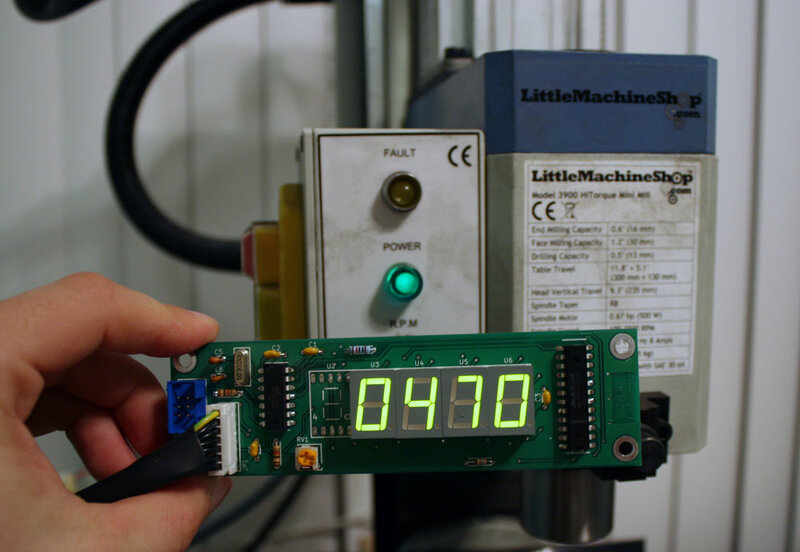 Within a second you should see the 7-segments turn on and display 0000. If you do not see this, TURN OFF THE MACHINE and email me along with what you see and I can help you out.